A 3-in-1 design allows for hand-held, waist-worn, or fixed leash handle conversions. A bonus traffic handle built in by the clip offers quick restraint. The handle is padded for comfort and a convenient accessory loop is included for bags or small items. Designed to integrate with the Crag Collar and Hoopie Collar. Not sure? 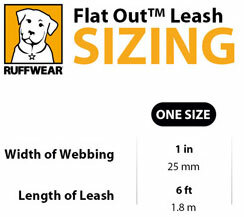 View the Ruff Wear Leash Comparison Chart to help find the one right for you. Click the button below to add the Flat Out Leash to your wish list.